The endangered North Atlantic right whale (Eubalaena glacialis) migrates to coastal waters off Florida and Georgia during the winter months. 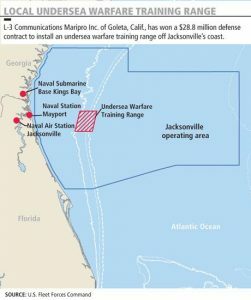 These winter calving grounds are adjacent to the U.S. Navy’s planned undersea warfare training range (USWTR) off the coast of Jacksonville, Florida. Aerial and vessel based visual surveys and passive acoustic monitoring supported by NOAA, Navy, and the State of Florida are currently being used to detect right whales in the coastal waters of Florida and Georgia, as well as at the site of the planned USWTR. These only provide information about animal locations at a single point in time. Currently there are few data on the movement patterns of individuals, including movement rates both in North/South and East/West directions, dive depths, and dive durations. The vocalization rates of individual right whales on these wintering grounds are also poorly understood. We will be conducting a targeted tagging program to fill in these knowledge gaps, by collecting horizontal movement, dive profile and vocal behavior from individual whales. These data are important to inform monitoring and mitigation techniques and to increase our understanding of the potential for disturbance to right whales as the USWTR construction and training operations commence. Non-invasive suction cup tags (anticipated tag duration from 1-36 hours) including fastloc GPS technology, time depth recorders (TDR), 3-D movement measurement, and acoustic recording capability will be attached to right whales of all ages and sexes to assess their movement patterns. Focal follows will also be conducted to gather additional behavioral information. Two vessels will be used to conduct this work: We will operate primarily from the R/V Stellwagen and R/V RT Barber, which have previously been used successfully for right whale work. During good weather we will launch a small boat from the Stellwagen to conduct the tagging and some of the focal follow data collection. The field team, consisting of members from Duke University, Syracuse University, and WHOI have conducted field work out of Fernandina Beach, Florida during February to March 2014-2017. In February 2014 weather conditions were suitable for tagging operations on 11 days, and right whales were located on 9 of these days. Tags were successfully deployed on right whales on seven occasions. Individual whales showed variation in movement patterns along the coastline. Only one tag was successfully deployed on a single right whale during 8 days of field effort in 2015 due to a very low number of animals being present on the winter grounds. Despite the lack of new data, additional work and analyses were undertaken focused on sound propagation modeling, creating and testing algorithms for detection and classification of right whale calls, and individual distinctiveness of right whale calls. Tag attachment to North Atlantic right whale during 2014. Photo collected under National Marine Fisheries Service Permit #14791. Analyses of the data, including dive statistics and acoustic data, are ongoing and are being conducted under the supervision of Dr. Nowacek and Dr. Parks with students and technicians in their laboratories. Preliminary results of this work have been reported at US Navy’s Marine Species Monitoring Program Technical Review meetings (2015, 2016) as well as at North Atlantic Right Whale Recovery Plan Southeast Implementation team meetings. In June 2016, researchers from Duke University, Southall Environmental Associates (SEA), and the University of St. Andrews met with representatives from Navy monitoring and research programs to discuss potential marine mammal behavioral response studies (BRS) in several key regions of the Atlantic coast. Potential research sites off Virginia, Florida, and North Carolina were considered and the relative logistical challenges and advantages of each location were evaluated, together with Navy interests regarding mid-frequency active sonar (MFAS) usage and the potential for coordination with sonar training operations. Short-finned pilot whale (GmTag176) equipped with a satellite-linked dive recorder off Cape Hatteras on 16 May 2017. NOAA Permit 14809. There was clear agreement among researchers and Navy personnel that the area off Cape Hatteras, North Carolina represents the best opportunity for an initial Atlantic-BRS (ABRS) effort using Navy MFAS. 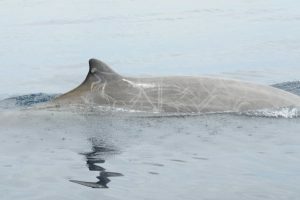 This was due to a variety of practical and logistical factors including the proven ability to consistently find and tag both Cuvier’s beaked whales (Ziphius cavirostris) and short-finned pilot whales (Globicephala macrorhynchus), as well as the proximity and availability of actual sonar sources (e.g. SQS-53C-equipped combat vessels) to participate. This project will generate BRS data in a new geographic area and increase the currently limited sample size of the behavioral response of key species to Navy tactical sonar. In addition, the effort will expand the temporal and spatial scales of previous BRS efforts by combining satellite-linked time-depth recording tags (SLTDRs) and short-term, high-resolution acoustic digital archival tags (DTAGs) in the same controlled exposure experiments (CEEs). The experimental objective for the first ABRS is to conduct a total of six CEE sessions per year over an initially anticipated two-year study period. We will conduct two field seasons each year (in spring and fall, based on extensive previous field work in these areas), with three CEE sessions conducted during each field season. To maximize the data collected during each CEE, many individual cetaceans will be monitored before, during, and after MFAS exposures using the two complementary types of tags. Ideally, each CEE will involve a focal individual of each species equipped with DTAGs. Thus, our goal is to deploy 12 DTAGs (six on pilot whales and six on beaked whales) during the CEEs each year. This will be complemented by a larger number of individuals (approximately 15 for each field season), primarily of the two target species, monitored using SLTDRs deployed in the weeks prior to CEE sessions. We will attempt to deploy DTAGs on groups of pilot and beaked whales that include animals previously equipped with SLTDRs and, in the case of pilot whales, to place DTAGs on individuals already tagged with an SLTDR. There is considerable value in maintaining consistency with previous BRS projects. Such consistency will allow comparisons to be drawn among studies and support the meta-analyses needed to derive dose-response probabilistic functions. Given that the coordination required with Navy combat vessels equipped with SQS- 53C sonar systems for BRS efforts off Hatteras, the overall experimental design will be based on the methods employed in SOCAL-BRS. This includes a period during which baseline behavioral data are collected prior to the CEE. These baseline data will be collected during a minimum of 60 minutes for animals with DTAGs, as in SOCAL-BRS. A minimum 24-hour baseline data period will be used for animals equipped with satellite tags, although most baseline data periods will be longer for this tag type. Pre-exposure baseline behavioral data collection will primarily involve data from tag sensors, supplemented by focal follows of tagged animals by observers in small boats. The methods employed during focal follows will be consistent with those employed in SOCAL-BRS and will be identical during the pre-exposure baseline, exposure, and post exposure periods. Male Cuvier’s beaked whale (ZcTag055) equipped with a satellite-linked dive recorder off Cape Hatteras on 10 May 2017. NOAA Permit 14809. Sonar transmissions during CEEs will occur in the same manner as in SOCAL-BRS. This includes transmission of full power (235 dB (RMS) re 1 µPa) signals of a constant nominal 53-C waveform type (single ping sequence using two sequential CP/CW waveforms 0.5 sec duration each with 0.1s separation for total ping series 1.1 sec duration) transmitted with a 25s duty cycle, using surface duct sector search mode, 3° downward vertical steering, and with ships transiting in a direct course at a speed of 8 kt. Transmissions will occur for a maximum of 60 minutes, unless any strong contra-indicators from the field team dictate a shut-down of the sound source. Starting positions and course for vessels will be determined using in situ propagation modeling given the position of a focal animal using the Navy-consistent models and unclassified databases in software developed and provided by the Naval Postgraduate School (NPS). The course of the vessel will result in an escalation in received level at focal individuals based on their movement generally (but not directly) toward individuals. Given the relatively large number of tagged individuals expected to be exposed during CEEs, individuals will have a varied exposure history of range and received level. Target received levels for the focal animals will range from 120-160 dB RMS and will likely differ between the target species (lower starting levels in beaked whales than pilot whales), at least in initial trials. This experimental design will allow for positioning of sonar sources to result in target received levels at focal individuals, but will also result in a diversity of received levels for other individuals at positions and ranges that will not be controlled, but known from positions derived from satellite tags. The analyses will focus on how beaked and pilot whales respond to MFAS exposure, in terms of: (a) potential avoidance behavior; (b) potential changes in behavioral state; and (c) potential changes in social behavior. Analyses will transition and apply successful methods developed in other BRS studies and the MOCHA project. Short- and longer-term consequences of disturbance will be evaluated separately using established analytical methods for short- and medium-term tags. However, this study will offer a unique opportunity to explore how these methods may complement one another and how high-resolution, short-term response data may inform methods used for longer-term monitoring. Satellite tagging field work for the first field session of 2017 was conducted from May 8-18 and resulted in deployment of 14 SLTDRs (5 Cuvier’s beaked whales and 9 short-finned pilot whales) in preparation for a CEE during the week of 22 May, and all preparations are in place for attaching DTAGs to both species for the same CEE. The Spatial and Acoustic Ecology of Marine Megafauna (SPAM) project assembles an international team of research scientists, data analysis specialists/modelers, citizen science experts, and educational professionals uniquely qualified to explore understudied and cryptic outer continental shelf (OCS) marine megafauna species. 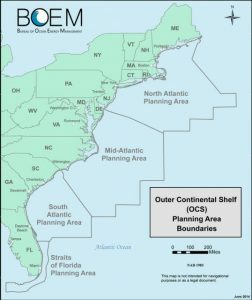 The exploration will include the use of passive acoustic monitoring (PAM), biotelemetry, visual surveys, software development, citizen science data collection platforms, and education and outreach to further the Bureau of Ocean Energy Management’s (BOEM) mission in its management and potential development of the OCS. The species to be studied will be determined at an initial data availability workshop, and the resulting research will be integrated into existing and new data structures that will be accessible to BOEM, as well as for public use and education. Promoting citizen science and education are priorities for the project, and as such, the work represents the creation of new, pertinent information and its dissemination across local to global audiences. The project will utilize existing, robust research methods and develop novel techniques that promise to add new data that can assist BOEM in its mission to protect the health and stability of marine mammals and their ecosystem, while managing OCS resources. As BOEM is required to design and implement mitigation measures to reduce or eliminate impacts from regulated activities on protected and managed species, a lack of data on infrequently observed, cryptic species can significantly hinder those efforts. Deep-diving, acoustically sensitive cetaceans (e.g., sperm and beaked whales) and poorly sampled species such as sei whales, are just such species, and they inhabit the shelf, shelf-break, and deep ocean waters of the U.S. OCS, including the OCS off North and South Carolina, which have recently been of interest for offshore energy development. The lack of information about the diving behavior and acoustic ecology of these species creates a high degree of variability in their detection probabilities and thus the analysis of data from passive acoustic monitoring, which is one of BOEM’s primary mitigation and monitoring tools for marine mammals. Verifying cue rates (a key for PAM analyses) for understudied cetaceans in diverse behavioral states and habitats is key in reinforcing BOEM passive acoustic studies nationally. The program will provide data to BOEM in its efforts to inter alia analyze the potential for significant impact from OCS activities pursuant to the National Environmental Policy Act (NEPA), including potential for harassment of animals under the Marine Mammal Protection Act (MMPA) and Endangered Species Act (ESA). The general goals of this project will be to address existing gaps in data of understudied cetaceans by leveraging vessel and animal-borne passive acoustic telemetry and expanding reach through citizen science and educational efforts. The team assembled to carry out this project consists of academic scientists with decades of experience in marine megafauna research, data analysts and modelers who work at the cutting edge of their fields, including providing products to BOEM and NOAA, and citizen science and education experts poised to dramatically increase the reach of our results. Task 1. Conduct a review and synthesize all available data related to passive acoustic monitoring of understudied species to prioritize sampling plan of cryptic cetacean species. Task 2. Describe acoustic, behavioral, and foraging ecologies of pelagic deep diving cetaceans; update uncertainty analyses; verify or establish cue rates. Task 3. Build on existing development of open source tag visualization software. Task 4. Incorporate citizen science to improve ability to gather, verify, quality control and sustainable community engagements on megafaunal sightings. Task 5. Create education products in support of non-technical audience. 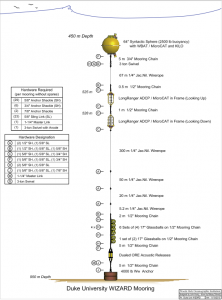 The mooring, in its final configuration, shows the primary components of echosounders, CTDs and ADCPs. Fisheries acoustics are routinely used for biomass and abundance surveys and used for behavioral and ecological studies of marine organisms. Marine mammal prey surveys are typically conducted from the ocean surface during shipboard surveys using active acoustic echosounders mounted over the side or in the hull of a research ship. The range for acoustic echosounders is limited by the absorption of sound through the water, and is dependent on the frequency produced by the instrument. 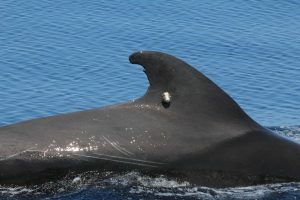 Typical prey surveys are therefore limited to providing data from only the upper couple hundred meters of the water column, and often cannot resolve prey targets at the depths of deep-diving predators like pilot whales, especially with the higher frequency instruments, which are needed to resolve small prey targets and useful in the frequency differencing techniques. The mooring system will address the temporal variability of the prey field off Cape Hatteras throughout the entire depth range observed for foraging odontocetes, e.g., pilot whales, using splitbeam echosounders. Furthermore, we hope be able to resolve deep sea squids in the lower half of the water column using frequency differencing in combination with single target detection of large prey targets. Task 1. Design and construct an autonomous, deep water, long term system to sample biological and physical properties. Task 2. 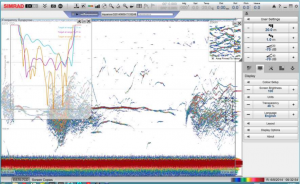 Identify seasonal changes in prey and hydrographic fields. Task 3. Identify prey field response to front crossings. Task 4. Test specific hypothesis that fronts can create a barrier to prey that predators could use as an advantage in prey capture. The WoMBAT shown in the rig used to test and calibrate. One of the 70 kHz transducers is located at the bottom of the rig. The Wideband WoMBAT Integrated Autonomous mooRing for Deep water (WIzARD) addresses the temporal variability of the prey field off Cape Hatteras throughout the entire water column. Relative prey density will be quantified using split-beam echosounders. The use of targeted frequencies (70 kHz and later wideband) will allow for relative frequency difference calculations that will be used to distinguish between 2 broad size classes of prey types; 1) large prey including fish and squid and 2) krill and other large zooplankton comprising the mesopelagic community. While deep diving pilot whales are likely targeting animals in the large prey category, having a second frequency to quantify the smaller size classes will help us to more accurately quantify the large prey and provide a broader ecological context to relative temporal variability of the biology for the region. The mooring system is designed for extended durations (servicing will be required every 10-12 months), allowing us to address the seasonality and the inter-annual variability in prey biomass and density in relation to ocean physical dynamics with low maintenance. In order to relate changes in the prey field observations to key environmental features (i.e., Gulf Stream front crossings), the mooring system will include an array of physical oceanography sensors. First, conductivity, temperature, and depth (CTD) sensors, or just conductivity, temperature sensors (CT) will be placed along the mooring periodically. 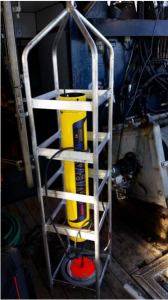 We will use a combination of alternating CTD and CT sensors to get accurate depth recordings at 3 places along the mooring line to get accurate depth of each instrument. While fronts will be identified using the density measurements, specific water masses will also be identified using hydrographic characteristics (i.e., low salinity Mid Atlantic Bight water, and warm, saline Gulf stream water). Secondly, two acoustic Doppler current profilers (ADCP) each operating at 75 kHz (manufactured by Teledyne’s RD Instruments) will measure current velocity throughout the water column. Current profiles are necessary to interpret hydrographic data by identifying time periods where upwelling may be occurring and to help understand water column dynamics by identifying the source of density intrusions. The ADCPs will be programmed to sample in long range and low power modes in order to provide data coverage throughout the entire depth range and to extend through the year-long deployments. The development of this tool comes at an opportune time as Simrad, the industry leader in scientific echosounders has completed development and delivered the first Wideband Autonomous Transceiver (WoMBAT), and this unit along with two transducers, one looking upward the other downward have been incorporated into the mooring. The two transducers, both operated by the WoMBAT, are angled slightly so as to: i) avoid pinging on the mooring string (downward looking unit); and ii) to sample a continuous column of water. The echosounder system has been fully tested and calibrated. All construction is complete, the components of the mooring (WoMBAT, ADCPs, CTDs) have all be tested and calibrated. The system was transported from Woods Hole to Savannah, GA where it was loaded on-board the R/V Savannah for the deployment cruise in mid-November, but the deployment had to be postponed due to high winds (>25 kts) and waves (10-12’) at the deployment site. We will deploy the system at the next available window of ship and personnel availability. While the construction and completion of the mooring has been completed, we do not have results yet as the mooring is awaiting deployment. The testing from the WoMBAT shows that the system truly is the next benchmark in quality of remotely collected echosounder data. The WBAT is a new product from Kongsberg-Simrad, and provides the industry-standard quantitative Simrad components in an autonomous package. With this project, we have had a hand in molding this new technology as one of its original customers, and we are at the leading edge in the field. Data recorded by the test/prototype Simrad WBAT unit. These data, taken from the Aquarius deployment, show a school of grunts with individual targets (upper left) tracked and their reflected frequency response shown. Also, the transducer was upward looking, which is relevant as one of the mooring transducers will be similarly oriented. At the Duke University Marine Lab we have a very active program of work supported by and of intense interest to the U.S. Department of Defense (DoD). This work, lead by Dr. Read, includes visual surveys and passive acoustic monitoring in three areas along the east coast of the U.S. One of these areas is precisely the location we are proposing for this instrument, so our instrument would be co-located with the HARP and sampling in an area that is routinely covered by visual survey, both vessel and airplane based. The areas monitored by Duke’s program include the Point area, as well Onslow Bay, and then directly east of Jacksonville, FL and the Mayport Naval Station. Our instrument would significantly enhance the research already being conducted at the Point under the awards to Duke and Dr. Read. This research is focused on understanding the distribution and basic ecology of the marine mammals that utilize this area so that potential effects of DoD activity (e.g., Naval movements or sonar) can be monitored and better understood. The data our instrument will collect would significantly contribute to the ecological understanding of the animals and the location. Likewise, the proposed instrument will significantly augment the research-related education currently occurring at the Duke Marine Lab. The education programs that will benefit include undergraduate, masters and PhD. At the Duke Marine Lab we have ca. 25 undergraduates in residence each semester, and these students are enriched by the research being conducted at the lab and they also have the opportunity, through independent study projects, to work directly with faculty and PhD students in analyzing data collected on various projects. At the master’s level, the Nicholas School at Duke offers a professional degree in Environmental Management, and these students often focus their final projects on data collected by faculty at the Lab. Additionally, as management students they often relate the science data to some policy issue, and so the data our instrument will collect, as it helps to elucidate the ecology of the area, will be important in policy discussions. Finally, several of our PhD students have already utilized the data collected under these DoD programs, and we have current students who are scheduled to work with the survey and acoustic data. In 2008 the IUCN Red List of Threatened Species classified the western Pacific subpopulation of gray whales as Critically Endangered. This subpopulation is also listed as Endangered in the Red Data Book of the Russian Federation. Western gray whales, as they are generally known, numbered well over 1,500 in the late 19th century. An estimated 1,800–2,000 were killed and processed by commercial whalers off the Korean Peninsula and Japan between 1890 and 1966. Today western gray whales occur only occasionally in most of their historical range in the Far East of Asia. The only places where they are seen regularly and in relatively high densities are two small, well-defined feeding areas on the north-eastern Sakhalin Shelf, Russia. Around 150 gray whales forage there intensively during the summer/autumn open-water season. Some of these individuals migrate to the west coast of North America for the winter, and some individuals are known to visit the coastal waters of Japan in the late winter and early spring months. The stock structure of gray whales in the North Pacific is not yet fully understood but the Sakhalin whales are of great scientific interest as well as conservation importance – they represent the potential for reoccupation of the species’ extensive historical range in the western Pacific, including coastal waters of Japan, Korea, China and Vietnam. This situation has been recognized (e.g. IWC, IUCN) requiring coordinated conservation actions. Sakhalin Energy’s loan agreement with the financing parties to the Sakhalin 2 Phase 2 Project includes a commitment to comply with a suite of environmental and social (E&S) management controls contained within the Health, Safety, Environmental and Social Action Plan (HSESAP). The HSESAP includes, inter alia, specific commitments in relation to the funding of the WGWAP, keeping the WGWAP informed of its offshore activities and implementation of all reasonable recommendations from the WGWAP. The international lender E&S standards applicable at the time of the Sakhalin 2 Phase 2 loan agreement were based on the 1998 World Bank Safeguard Policies. However, the Company has now voluntarily committed in an update to the HSESAP to comply with the more recent 2012 IFC Performance Standards on Social and Environmental Sustainability. It is therefore a requirement of the Company that its management approaches to the protection the WGW, including through the advice provided by the WGWAP, are in compliance with the IFC Performance Standards. (a) to provide independent scientific and technical advice and recommendations to Sakhalin Energy, the MNR/IWG (and other stakeholders when appropriate) with respect to the actual and potential effects of human activities, particularly oil and gas development activities, on WGWs – recommendations can be made both on a proactive (anticipatory) basis and in response to specific requests for guidance. (b) to understand and provide advice on how to minimize the actual and potential impacts of Sakhalin Energy and, to the extent practicable, other activities on WGWs, including both oil and gas development and routine production operations. (c) to place WGWAP advice in the context of compliance with the IFC Performance Standards (with a specific focus on Performance Standard 6). (d) to integrate expertise on conservation science and technology relevant to the conservation and recovery of WGWs throughout their range and to make this expertise widely accessible, including liaison with the IWC Scientific Committee, the IWC/IUCN Conservation Management Plan and the Memorandum of Co-operation amongst range states. (e) to encourage and provide advice on research aimed at (1) improving and developing methods for the assessment of the potential effects of human activities on WGWs and (2) developing and monitoring the effectiveness of mitigation measures. (f) to develop industry good practice for the protection of WGWs. (g) to provide opportunities for coordination and cooperation among interested parties, including companies, governments, research groups, financial institutions, and civil society. (h) to take into account the principles of conservation, current efforts and requirements identified by the Government of the Russian Federation (MNR/IWG, RPN) and Sakhalin Oblast Government regarding activities on the Sakhalin Shelf. (a) Review all relevant information on WGWs. (b) Conduct annual assessments of the biological and demographic state of the WGW, and use these assessments as a basis for recommendations and advice on WGW conservation needs and research priorities. (c) Provide scientific, technical and operational recommendations it believes are necessary or useful for the conservation and recovery of WGWs. (d) Assess whether Sakhalin Energy’s research activities, assessments and proposed mitigation plans (i) take account of the best available scientific knowledge, (ii) address important information gaps, and (iii) interpret both existing knowledge and information gaps in a manner that recognizes and reflects scientific uncertainty. (e) Assess whether the research activities, assessments and proposed mitigation and offset plans are adequate for mitigating (or in the case of offsets, compensating for) impacts on WGWs and are in line with the requirements of IFC PS1 and 6. (f) Review (i) the effectiveness of existing mitigation and offset measures as determined from monitoring programme results, and (ii) the likely effectiveness of proposed mitigation and offset measures; and provide recommendations regarding modifications, alternatives or the development of new measures. 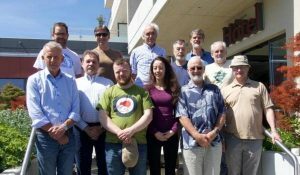 (h) Co-operate with the IWC Scientific Committee, and others in providing scientific advice for the update and implementation of the IUCN/IWC Conservation Management Plan and Memorandum of Co-operation amongst Range States.